We are not pretentious people. We are hard workers with Midwestern roots. Our aim is to bring something of beauty into your home or business. We call our customers friends. We make sculptures that privilege form over matter; the idea, the mood, and the movement over the particular manifestation. They are, in this sense, abstract. The flip side of abstraction is fullness of possibility. We've had customers tell us they see whale tails where others see cats, a burning bush where others see sawgrass. We sculpted our vision of the Garden of Eden and titled it simply, "Garden." One garden partakes of every garden, or so is the notion our art (and the best in us) entertains. Our sculptures, though stationary, privilege motion over stasis. By means of curved and fluid edges and surfaces, polished to a sheen, they often seem to be melting, glowing, and slowly turning. They have an immediacy that our customers at art shows and festivals sometimes capture with the observation, "We saw your sculptures from the road . . . We thought they were ice sculptures!" Our sculptures are dalliances of light. Abundant in curved, smooth edges, they catch and reflect and amplify surrounding light. 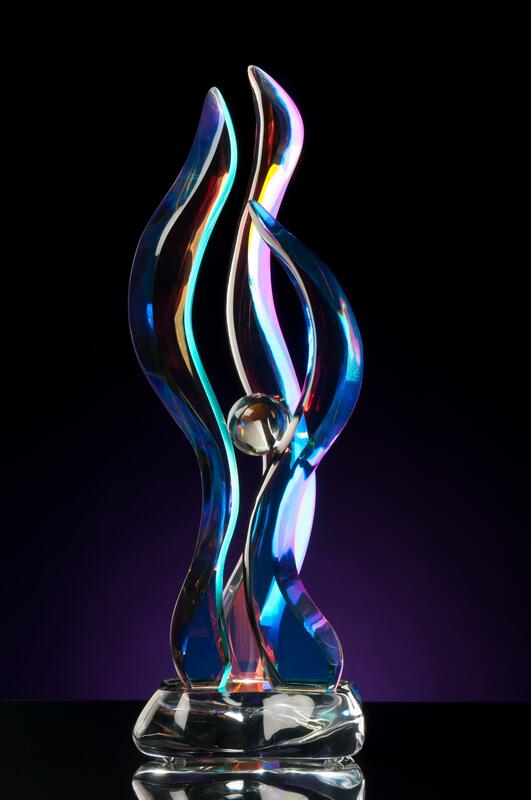 Our original, clear acrylic sculptures have a chameleon-like quality: glowing radiantly silver in moonlight, in soft indoor light, or against a cloudy sky; glowing hot silver in bright light. If there is any color nearby, they will pick it up and reinterpret it with a series of internal echoes and mirrorings: a single color source will often be visible in several different parts of a sculpture. Change your viewing angle and the whole system of mirrorment changes, a result of many partially reflective, partially transmissive surfaces facing one another, many or most of them curved (which refracts and disperses the light as well). This is effortless Cubism. Our newest acrylic material is dichroic, meaning it slices light into a spectrum of color by means of the physics of constructive and destructive interference. Light's wave-like properties allow it to interfere with itself, or assist itself. Think of two peaks producing a greater peak (or two valleys a deeper valley), while a peak and a valley tend to cancel one another out. In the context of light frequencies, a partial cancellation produces a lower, or redder, frequency. This is the physics behind a soap bubble's brief but brilliant colors. Upshot: Our dichroic acrylic sculptures display all the lightplay of our original acrylic sculptures, together with new and shimmering iridescent effects. A ball is a realization of a sphere. A sphere is the simplest way to gather space. It also gathers the most space, since no other form in three dimensions has greater volume for its surface area. In other words, it is the most protected shape; the most inward per unit surface. It has long been considered a symbol of perfection and unity. An ovoid, like an egg, is a sphere stretched slightly. Made stronger and more physically resilient, like an arch, and given two ends. In our sculptures, balls are sometimes included in both natural and domestic settings. In natural settings, we think of them as approximate eggs. In abstract and peopled settings, we think of them as small worlds: worlds apart in abstract pieces, and worlds together in love and family. Birds figure into many of our pieces. Often they are gathered or nested. Often they have long necks and reach upward to feed or sing. Florida is a haven of birds, especially wading birds, and our sculptures are a second space for them -- to be still, enjoyed, and contemplated. Dolphins and whales are graceful creatures. Intelligent, patient, and living long spans, they are some of our closest companions in nature. In our sculptures, dolphins frequently appear leaping up, in play or display. With just their tails exposed, whales frequently appear descending into seawater, full of air, having skimmed the boundary. Whether water, fire, or accessory of (and to) life, an undulating curve is an undulating curve, so we use similar shapes for all three. These are atmospheric elements in our sculptures: each draws a curtain around the subject and a pulls a ribbon through it. Late to the party, humanity certainly makes a splash. Sails in a harbor -- taut and rippling or slack, their boats collecting together into schools or dispersing, racing or wayward -- can be as fine and varied a thing as insects' wings. In regattas or anchored off lost islands, sailboats feature often in our sculptures. We think people are a part of nature, if an extraordinary part. They share their world with a rich menagerie of other creatures and forces, or should. As people become what they are in the company of others, we rarely sculpt a lonely individual. People come in pairs, threes, fours, and families of all kinds, with children of all ages. Tell us about your family (including your cats and dogs) and we'll do our best to sculpt a likeness, in our own signature, abstract way.